This report examines JDRF's Payroll Expenses, which includes salaries, bonuses, and all other staffing expenses. 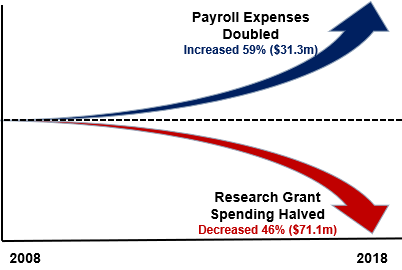 As illustrated in the opening chart, over the last 10 years JDRF Payroll Expenses have doubled while JDRF Research Grant Spending has been cut in half. In addition, the amount of Payroll Expenses has been nearly equal to the amount of money given to support research grants since 2015, corresponding directly with the tenure of the current CEO. In every year prior to 2015, the amount of money spent on research grants was always materially higher than the amount spent on payroll. 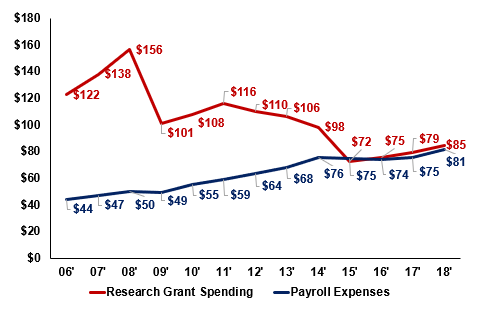 JDRF Research Grant Spending decreased from $156.4m in 2008 to $84.7m in 2018. JDRF Payroll Expenses increased from $50.1m in 2008 to $81.4m in 2018. Said differently, JDRF Payroll and Related Expenses have increased by 59% over the past decade while research grant spending has declined 46%. JDRF has not publically acknowledged this dramatic decrease in research grant spending or the incredible increase in the amount of money that goes to JDRF Payroll Expenses. Payroll Expenses have seen a greater increase compared to every other major JDRF spending category over the past 10 years. During the same time frame, research grant funding, the most important and strategic job of JDRF, declined by $71 Million. Based upon this straightforward analysis, it appears that increases in payroll, both in salary increases and hiring of new staff, were paid for by a decrease in research grants. Donors must decide if this is an appropriate trade-off and should vocalize their concern if they disagree with this shift. Research and Support: Payroll related to staff who identify and manage research grant making. This category grew by +133%. Public Education: Payroll related to staff who provide education materials and lead advocacy programs. This category grew by +68%. Fundraising: Payroll related to staff who lead and implement all fundraising activities. This category grew +46%. Management and General: Payroll related to the executive management staff, including CEO, CFO, etc. This category grew +22%. Executive pay levels for the top 5 highest paid employees increased by 50% from $1.7m in 2008 to $2.6m in 2018. Executive pay for the top 10 highest paid employees nearly doubled from $2.3m to $4m between 2013 (the most recent year this data is available) and 2018. The number of employees who made more than $100k increased from 118 to 162 between 2013 and 2018. The goal of the JDCA in preparing these reports is to provide financial donors and fundraisers with high-quality information written in an easily accessible format. All data presented in JDCA reports is sourced from official, publically available JDRF audited financial documents. We hope that this information will enable charitable giving decisions that fulfill the donor's objectives and priorities. We believe that every organization benefits from an external perspective and open dialogue. While some of the information we report is critical, the intent is to ultimately help all participants become stronger fundraisers, financial contributors, and researchers. Accountability is essential for exceptional performance.